Hi Aspirants, here is the Current Affairs Quiz for 8 March 2016. 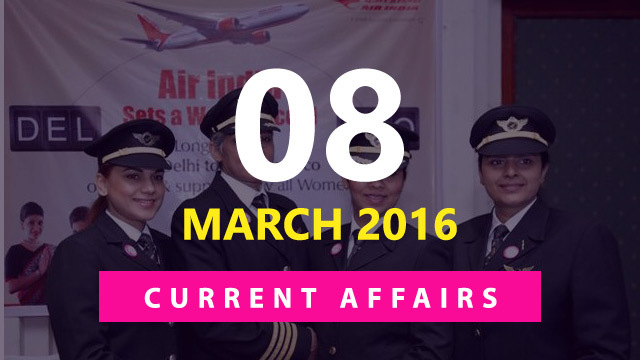 Trending topics for the day include International Women’s Day, “world’s longest” all-women-operated flight by Air India, Mahila E-HAAT etc. Attempt the quiz to check details of each topic. 1) International Women’s Day is celebrated on? 2) What is the theme of International Women’s Day 2016 observed on 8 March 2016? 3) Air India on 7 March 2016 flew the “world’s longest” all-women-operated flight from Delhi to which city? 4) Which country has recently decided to partner with India’s smart city programme and will help developing Kochi (Kerala), Bhubaneswar (Odisha) and Coimbatore (Tamil Nadu) as smart cities? 5) Which women tennis player was on 8 March 2016 provisionally suspended after failing drugs test at Australian Open? 6) Who was recently conferred prestigious 2016 Mahindra Samriddhi India Agri Lifetime Achievement Award also known as the Krishi Shiromani Samman? 7) Union Government on 8 March 2016 launched an online marketing platform ____ to facilitate women entrepreneurs to sell their products to buyers? 8) _____ on 6 March 2016 became the first financial entity in India to get Small Financial Bank Licence by the Reserve Bank of India (RBI)? 9) Raymond Tomlinson who died on 7 March 2016 is the Internet pioneer and inventor of? 10) Which country won the 2016 Asia Cup T20 trophy cricket tournament? Note: International Women’s Day was first observed as a popular event after 1977 after the United Nations General Assembly (UNGA) has proclaimed to observe March 8 as the UN Day for Women’s Rights and World Peace. Note: The flight was operated as part of International Women’s Day celebrations and travelled a distance of around 14,500 kilometres in close to 17 hours. The non-stop flight to San Francisco took off on 6th March 2016 from New Delhi. Note: In the final match played at Sher-e-Bangla National Cricket Stadium, Mirpur Indian team overhauled the chasing target of 121 runs set by Bangladesh by seven balls to spare.